What protocol is used for sending Email? Email protocols are the rules and procedures for sending and receiving email. The main protocols you will encounter on the Internet are POP3, IMAP4 and SMTP. The Internet email protocols are single function protocols i.e. they do a single job. The POP3 and IMAP4 protocols are for receiving or fetching email from an email server. Whereas the SMTP protocol is used for sending emails between email servers, and also for sending email between an email client and server. Internet email protocols are text-based protocols, and use a command/response type format, as they were initially used from a command prompt. Internet protocols are specified in RFCs (Request for Comments) and are associated with standard TCP ports. Another common protocol is MAPI, which is a Microsoft proprietary protocol used by Microsoft Exchange server and outlook for email and calendars. SMTP stands for simple mail transfer protocol and is the protocol used for sending email on the Internet. The SMTP protocol is used by your email client to send email to the email server, and is also used when email servers send email to each other using a MTA (Message transfer agent). There are three ways email providers authenticate an SMTP user. When you connect to your ISP you are allocated an IP address. If your email account is held by your ISP then you normally don’t need to authenticate to send email. This is because the ISP detects that the sending SMTP client has a known IP address, and hence trusts it. However what if you access your email Using a different IP address than normal ? This is typical if you travel and you access the Internet via another Network e.g. company network, public WiFi. In this case your IP address will not be trusted, and you may need to use another authentication method or a different SMTP server. If your ISP isn’t your email provider then you normally need to login in order to send email. This the most common authentication method used. Click the account to highlight it. so then you have finished configuration as this account is used by default . However you may be sending mail using a different provider than for receiving email then you will need to click settings tab and then select the logon using radio button and enter a username and password. When sending email some email servers will check that the address in the from field is a registered email address on that sever. If you have an email account on that server then it isn’t a problem. addresses/accounts, and are trying to send all email through a single SMTP server then this may cause problems. Some email providers recognise this, and allow you to enter other addresses that you may use in the send field. They usually have a mechanism to verify that the address belongs to you. 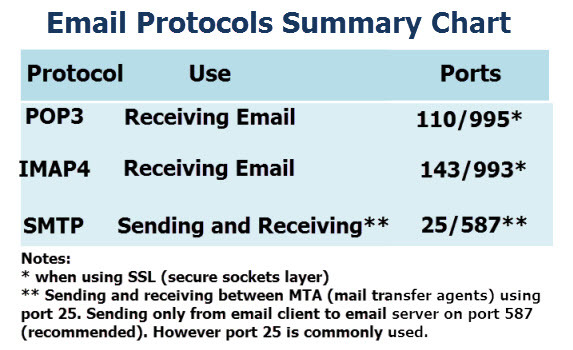 The standard port for SMTP is port 25 but SMTP secured by SSL (secured sockets layer) normally uses port 587,although other ports like port 465 are also used (e.g. Google Gmail) . alternate email addresses to the main email address ( the one you use on the main SMTP account). If it isn’t possible to do this then you will need to use a separate SMTP account for each email address. Many ISPs and free providers (e.g. Google,Yahoo) will block email that is sent to multiple recipients (Typically >100 recipients), and will block a continuous stream of emails. Sending using an online autoresponder service. Message size limitations will also be in place (25MB is typical). However your own SMTP server may not be the restricting server as the message typically passes through several SMTP servers to reach the final destination. You may find this video on SMTP useful. 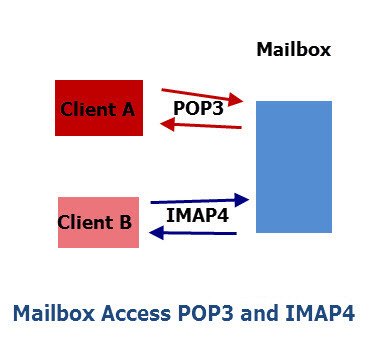 A mailbox is neither POP3 or IMAP4, as POP3 and IMAP4 are access mechanisms for receiving email, and a Mailbox can support access via either and, or both protocols. POP3 is the older of the two protocols, and most widely used, but isn’t as powerful as IMAP4. Most email clients support both protocols. If your email provider also supports IMAP, then IMAP is the preferred choice. POP3 was designed to be used in offline mode, and was ideal in the days of dialup connections as you would connect to the email server, download your emails, and then disconnect. The emails were now on your local computer, and you could read them off line. Because it was designed for offline working the emails were deleted from the email server once they had been downloaded to your computer (This can be changed). 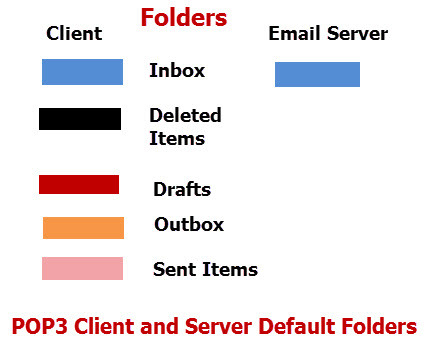 With POP3 Sent email is stored in the sent items folder on your client and never on the email server. The email needs to be downloaded to your computer before you can read it. It is difficult to access the email from multiple computers and remote locations..
sure you do email backups! transfer email to the new computer. Pop3 uses normally uses TCP port 110 but when secured using SSL (secured sockets layer it uses port 995. The IMAP4 protocol was designed as a replacement for POP3. Like POP3 it is a receive only protocol designed to access email from a mailbox on an email server in an online mode. This means that the email remains on the server where it can be accessed by other email clients at other locations. This makes it ideal for users who want to access their email from different machines/locations i.e. Remote Email Access. Sent email is stored in the sent items folder on your client and usually synchronised with the sent items folder on the email server. In addition IMAP4 has richer functionality in manipulating inbox messages, and can manage other mail folders besides the inbox. It also has better performance when dealing with large messages. However not all email providers provide email access using IMAP4 access. If we look at the folders on the email client and server for a mailbox using IMAP4 we see a completely different picture than for POP3. However all folders can be synchronised. IMAP uses normally uses TCP port 143 but when secured using SSL (secured sockets layer it uses port 993. 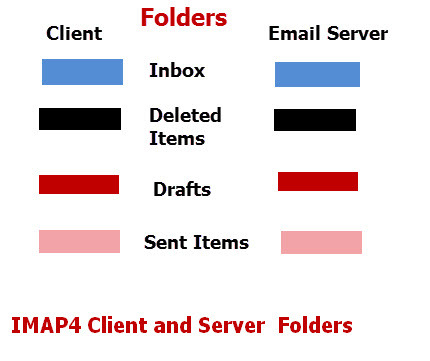 IMAP4 clients can access any folder, and not just the inbox. HTTP isn’t strictly speaking an email protocol, but it is used for sending and receiving email when using a webmail client, and also now in most mobile email Apps. HTTP cannot just only send and receive email it can also provide access to email contacts. It is likely to become the main protocol used for sending and receiving email. A- No See How to change from POP3 to IMAP4 . Q- I have 2 email accounts (A and B) can I send all email through the SMTP server of email account A? A- Yes- SMTP was originally open, and so you could point you email client at any SMTP server and send email through it. However because of SPAM all SMTP servers are secured, and so you will need an email account on that server in order to do it. So provided you have an account then you can do it. Q- What protocols can be used foe sending email? Q- Which protocol is used for transferring email between email servers? Q- What two protocols are used to deliver email messages? IMAP4 is the better access method, and is recommended if your email provider supports it (most do but not all). SMTP is the mainstay of the email network as it handles message delivery across the Internet. It is used for sending email between an email client and email server and also between email servers. MAPI is used by Outlook clients in Microsoft Exchange email networks. It is a client server protocol, and handles sending/receiving email as well as calendar, and directory access.